Believers of William Branham's message often challenge those outside of the message to "find one scripture in the Bible in which anyone was ever baptized in the name of the Father, Son and Holy Spirit." People in the message are taught that the only true form of Christian baptism is in the triune name of the Lord Jesus Christ. This is an highly important issue for message believers and we are aware of at least one instance where a deacon baptized an individual in the name of the Lord Jesus and was required to baptize the person again in the name of the Lord Jesus Christ. 4 Why does Jesus say to baptize one way but Luke tells us a different way? 4.1 What is the name of the Father, and of the Son, and of the Holy Spirit? Nowhere was we ever commanded to baptize, "In the name of the Father, and in the name of the Son, and name of the Holy Ghost," not nowhere in the Scriptures. It's a Catholic creed, and it's not for the Protestant church. I'll ask anybody to show me one Scripture where any person was ever baptized any other way than in the Name of the Lord Jesus Christ. Come, show it to me, and I'll put a sign on my back, "A hypocrite, and a false prophet, a false teacher," and go through the streets. There's no such a thing. Never was anybody baptized that way. It's a Catholic creed, and not a Protestant doctrine. So there is the challenge laid down by William Branham - Find one scripture where any person was ever baptized any other way than in the Name of the Lord Jesus Christ. Actually that challenge is quite easy to meet and we would challenge message believers to find us one scripture where anyone was actually baptized in the name of the Lord Jesus Christ. The Bible should be simply understood and therefore it seems quite obvious that William Branham has interpreted the scripture to say something that it clearly doesn't. The phrase "Lord Jesus Christ" appears 6 times in the book of Acts so it would have been very easy for Luke to have stated clearly that people were to be baptized in the name of the Lord Jesus Christ. But since he didn't, it is not possible to make that claim. For as yet he was fallen upon none of them: only they were baptized in the name of the Lord Jesus. For has many of you as have been baptized into Christ have put on Christ. So we have certainly found multiple scriptures that show people begin baptized in a form other than the three-part Name of the Lord Jesus Christ. It is clear from the Bible that there did not appear to be an emphasis on the exact formula of baptism, thereby proving one of the fundamental doctrines of William Branham's message to be flawed. If you show me the page or anything, you write it and lay it up on here for me tonight, and I'll walk out of this church saying, "I am a hypocrite; I have taught people wrong;" if you can show me one text of Scripture or bring me one history, authentic history, that'll show me that where that people ever baptized in the Bible in the name of "Father, Son, Holy Ghost"; or bring me one scrip--or one book of history, one page, one quotation in history where anybody was ever baptized in the name of "Father, Son, and Holy Ghost" until the Nicene Council of the Catholic church, come bring it to me; and I'll pin a sign on my back and walk through Jeffersonville, and you behind with a horn, blowing; I'll put on there, "A false prophet, misleading the people." William Branham's reference to the Nicene Council is to The First Council of Nicaea. which was a council of Christian bishops convened in Nicaea in Bithynia (present-day İznik in Turkey) by the Roman Emperor Constantine I in AD 325. However, William Branham's assertion that no one was baptized in the name of "Father, Son, Holy Ghost" is historically incorrect. While it appears clear that the very earliest forms of water baptism in the Book of Acts do not reference the trinitarian formula, it is also clear that the use of the trinitarian baptismal formula does predate the First Council of Nicea by at least a hundred and fifty years or more. The Didache or The Teaching of the Twelve Apostles (Didachē means "Teaching") is a brief early Christian treatise, dated by most scholars to the late first or early 2nd century. Some even date it as contemporary with the books of the New Testament (c. A.D.40-60). However, because of references in literature from the early 4th century, no scholars date the Didache as later than the 3rd century. Baptism has been in the name of the Father, Son, and Holy Spirit at least from the end of the 1st century. Some passages in Acts (2:38, 10:48, and 19:5) speak of Baptism ‘in the name of (the Lord) Jesus (Christ)’, but whether this formula was ever used has been questioned. But what is the proof behind this statement? "After his resurrection he promises in a pledge to his disciples that he will send them the promise of his Father; and lastly, he commands them to baptize into the Father and the Son and the Holy Ghost, not into a unipersonal God. And indeed it is not once only, but three times, that we are immersed into the three persons, at each several mention of their names" (Against Praxeas 26 - A.D. 216). "The Lord himself told his disciples that they should baptize all peoples in the name of the Father and of the Son and of the Holy Spirit . . . for indeed, legitimate baptism is had only in the name of the Trinity" (Commentary on Romans 5:8 - A.D. 248). If there's a historian, a minister, any other person, on air, in tape, that can produce one Scripture or one speck of history, where anybody was ever baptized any other way than in the Name of Jesus Christ, till the Roman Catholic church at Nicaea, Rome, you're duty bound to bring it to me, let me apologize. There is no such thing. No. And every person that was baptized by immersing, that was not baptized in the Name of Jesus Christ, was commanded, before they could enter Glory, to come back and be rebaptized again. Now it's up to you. Based on the evidence above, William Branham should have apologized. He did not know the history of the Christian church. Now, they organized together and call them United Pentecost. They break up from the rest of them because of an issue of water baptism. That don't make them any hypocrite. There's many a genuine, real genuine Holy Ghost born again Christian in their ranks. And God gave them the Holy Ghost by being baptized in Jesus' Name, and He's give the others the baptism of the Holy Ghost being baptized in Father, Son and Holy Ghost. So God give them the Holy Ghost who obeys Him, so who—who got, who obeyed Him? There you are. If you'd just forget… And them that wants to be one way let them be, and you go ahead and be brothers. That's all. Don't… What done it, was breaking among—breaking away (See? ), breaking, tearing up, breaking up brotherhood, setting out and separating yourselves. No, sir; we're not separated; we're one. That's right. He also repeated this very clearly in his vision of the plum and apple trees. Now, do you say then, "Do you believe that all these people that—that's trinitarians are of hell?" No, sir. I believe they are Christians. But the hour is approaching, brother, where they are sincerely wrong. Any man, anywhere, anytime, that wants to talk on the subject, come to me; any minister, bishop, archbishop, whatever you might be. And this is taped, will go around the world. I ask in brotherly love, for any person that hears me on this tape around the world, that will come to me and show me one text of Scripture or one paragraph in any history (that's authentic history) where that any person was ever baptized in the name of the "Father, Son, and Holy Ghost" until they organized with the Catholic church, I'll change my doctrine. 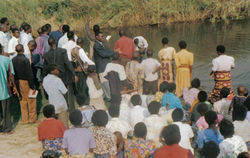 Every person was baptized in the Name of Jesus Christ! And my precious brethren, your eyes are blinded to those things. Pray God give you Light! Now, if you got Scripture to support it, I'll be looking for you or listening for your call. You're… you… Beyond this tape, you're willfully walking in spiritual ignorance if you don't challenge me on that. If you want to know what's Light and what's dark, let's ask God. Remember, I say THUS SAITH THE LORD! If you believe me to be His servant… And if that wasn't according to the Word, it would be wrong. Then if it isn't according to the Word, it's your duty to come straighten me out, uh-huh, see what happens. Uh-huh. It's a error! 178 I believe that many thousands of trinitarian people who believe in three Gods is saved, because they don't know any difference. We're going to get to that on down in the message. I have made my mistakes, brethren, and I've done so many things that's wrong. And if any time along the road I've brought, or you have heard something that I might've remarked or said that give an offense of some kind, or if I said something this morning that give an offense, I ask you as a Christian brother, sister, forgive me. I don't mean to do it. I've only expelled to you my heart so that we would know. If there's any baptizing to be done, you brethren do it yourself. See? That's… I don't do it. If I have, that's the way I'll baptize one, like that. Either one of you can take it. See? So you can take the person they're baptized in the Name of the Father, Son, and Holy Ghost, and they're baptize in the Name of the Lord Jesus Christ too. So if I ever baptize one… But I haven't done it yet. I have only baptized in my own church, and that's just the people there. And that's the way the people at my church are baptized. If you'll look back, that's the old Missionary ritual, the old Missionary Baptist ritual. And now, if… Now, that's that. The question must be asked - Why did William Branham change his opinion based on who he was preaching to? Why does Jesus say to baptize one way but Luke tells us a different way? Why in the Book of Acts (Acts 10:48 and Acts 19:5) is baptism never performed as in Matthew 28:19, in the name of the Father, and of the Son, and of the Holy Ghost? Various answers have been given. Baptism in the name of any one of the Persons of the Trinity involves baptism in the names of the other two. Luke, though employing the shorter, really meant the longer formula. The longer formula was designed for Gentiles who had never known the Father, the shorter for converts from Jewish people or Jewish proselytes. The Didache, or Teaching of the Twelve, an ancient document that may date back as early as 70 A.D., seems to favour the second explanation by using as synonymous the two expressions, “baptism into the name of the Lord” and “baptism into the name of the Father, and of the Son, and of the Holy Ghost”. What is clear is that the effects of baptism were attributed to the water and not to an exact formula of words. The Didache, Justin Martyr (c. 100–165), and Cyprian (c. 200–58) describe a baptism with the trinitarian formula as a baptism “in the name of Jesus.” A compulsory liturgical form is far removed from early times. What is the name of the Father, and of the Son, and of the Holy Spirit? ...and Peter, being filled with the Holy Spirit identifying the NAME as that of "the Lord Jesus Christ". Of course, nobody was ever baptized in Scripture using that formula, and Peter said "name of Jesus Christ", and omitted Lord if he had a revelation to share God's unique name. WMB stated that " The Name of The Father,Son and Holy Ghost is The One and only LORD JESUS CHRIST. " Then the Bible is wrong, because it NEVER calls the Father or the Holy Ghost Jesus Christ. Jesus is called, "Lord" all the time. And in Exodus, God says that His name is Yahweh and THAT will be His name FOREVER. You can't go inventing your own Bible. Thank God that His Word never changes, and He needs no New message. The old, timeless Gospel of Jesus Christ is just fine. Only the Son is ever referred to as Jesus, or Lord Jesus, or Jesus Christ, or Lord Jesus Christ. ↑ F. L. Cross and Elizabeth A. Livingstone, eds., The Oxford Dictionary of the Christian Church (Oxford; New York: Oxford University Press, 2005), 151. ↑ Justin Martyr, “The First Apology of Justin,” in The Apostolic Fathers with Justin Martyr and Irenaeus, ed. Alexander Roberts, James Donaldson, and A. Cleveland Coxe, vol. 1, The Ante-Nicene Fathers (Buffalo, NY: Christian Literature Company, 1885), 183. ↑ Thomas Whitelaw, Acts, The Preacher’s Complete Homiletic Commentary (New York; London; Toronto: Funk & Wagnalls Company, 1892), 45. ↑ William Sailer et al., Religious and Theological Abstracts (Myerstown, PA: Religious and Theological Abstracts, 2012).